KEF LS50 Wireless: the future of hi-fi and Hall of Fame winner | What Hi-Fi? KEF’s LS50 speakers have come a long way in five years. The originals were released in 2012 to celebrate the company’s 50th birthday, and promptly won a What Hi-Fi? Award. To this day they remain a fine pair of stereo speakers. What we have here is a supercharged version: the LS50 Wireless may look like a pair of speakers, but it is in fact a complete, all-in-one digital music system. A plethora of connections and seriously impressive sound make it a brilliant one at that. Not only is it our Product of the Year music system, but it has also entered What Hi-Fi? 's Hall of Fame. Thanks to built-in Spotify Connect and Tidal, you really do have a source inside the speakers, allowing you to stream your music from the dedicated KEF LS50 Wireless app on Android or iOS devices. The LS50 Wireless can connect to a NAS drive or computer, too, so you can play your digital music. It includes support for hi-res audio up to 24-bit, 192kHz, and works over Wi-Fi or Ethernet connections. Thanks to the stereo analogue, digital optical and USB-B inputs, you can also connect anything from a CD player to a TV and benefit from the system’s great sound. All of this technology is housed within the two speakers, so you don’t need any more boxes. The active speakers have their own power amps and DACs, but also act as preamp and streamer. As for performance? Well, there’s a reason this system is an Award-winner. Using KEF’s patented Uni-Q driver technology, the LS50 Wireless delivers a broad, expansive soundstage, complete with impressive stereo imaging. The system sounds clean and precise, digging up impressive detail and presenting it in an organised fashion. 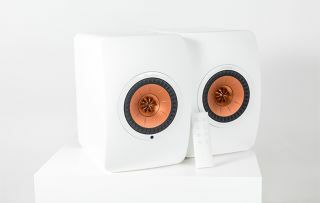 From the surprisingly powerful bass to fluid midrange and insightful highs, these are compact speakers that can comfortably fill a large room at high volume and still sound superb. Overall, these speakers are revealing and informative but always musical and entertaining: a triumphant marriage of form and function, and that’s why the KEF LS50 Wireless wins this year’s Product of the Year Award for best music system and enter our Hall of Fame.